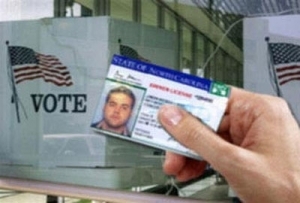 The state Senate gave final approval Friday to a constitutional amendment that would require North Carolina voters to present photo ID at the polls. The amendment question will appear on the ballot in November. The votes in the House and the Senate were along party-lines, carried by the Republican supermajority. Democratic lawmakers in both chambers stressed evidence doesn’t support the idea that voter fraud is enough of a problem to necessitate photo ID, which would create another hurdle for those who want to vote and disenfranchise low income and minority voters who disproportionately lack a qualifying ID. Last year the State Board of Elections released the results of an extensive audit of the 2016 election. The audit did turn up problems. Out of the nearly 4.8 million votes cast, the report found only one would probably have been prevented with a voter ID law. Sen. Jay Chaudhuri (D-Wake) said the push for voter ID is not about the integrity of elections. “It’s about an amendment that disproportionately impacts African-Americans, Hispanics, seniors, the disabled and young voters,” Chaudhuri said. But Republican lawmakers said requiring ID makes sense, even if there is no evidence that elections are compromised without it. “Even if there were no voter fraud — and I don’t believe that that is the case — most of us lock our door every night even though there’s no crime,” said Sen. Bill Cook (R-Beaufort). Gov. Roy Cooper does not have veto authority over constitutional amendments. Civil liberties groups were quick to condemn the General Assembly’s passage of the amendment. Tomas Lopez, executive director of voting rights group Democracy North Carolina, agreed. In 2013 the General Assembly passed House Bill 589, which made massive changes to voting laws in the state — among them requiring voter ID. The 4th Circuit Court of Appeals struck down the law, finding it targeted minority voters with almost “surgical precision,” and found cures for problems that didn’t exist. Republican lawmakers hold that, had the U.S. Supreme Court taken up the case, it would have upheld the law. They blame the court declining to do so on Cooper and N.C. Attorney General Josh Stein, both Democrats, declining to defend the law when they were elected last year.